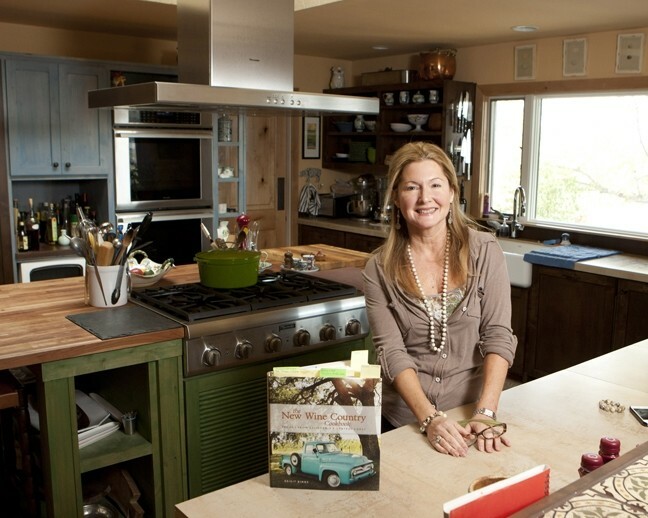 COOKBOOK KITCHEN: Author Brigit Binns showcases her kitchen where ideas for new cookbooks come to life. For most American families, it’s traditional to watch Dad carve the turkey at the Thanksgiving table. But the kudos really go to our Moms for taking on the detailed tasks required to create that very special, nurturing meal. That thought motivated me to turn to professional women to request recipes that use up the leftovers behind the great American feast. When it comes to me, after the cold turkey sammies, the hot turkey sammies, and the ubiquitous turkey pot pie, I’m so done with the bird. But I’m sure these delicious recipes from a local chef and two authors will help me forget I’m still eating turkey. Now, I know I won’t be tossing the roast turkey remains into the garbage can. Author Brigit Binns, who featured California’s Central Coast in her New Wine Country Cookbook, offered a tasty turkey Cobb salad that’s made in only 10 minutes. The author has published 28 cookbooks, including Williams-Sonoma’s salad series in which this recipe was first published. Place four large shallow bowls or plates in the refrigerator to chill. In a large mixing bowl, combine the vinegar, salt, a generous grinding of pepper, mustard, Worcestershire, mayonnaise, and olive oil. Whisk until smooth and then stir in a quarter of the crumbled blue cheese. Now add the iceberg and onion, toss well to coat evenly and taste to adjust seasoning. Divide salad among the chilled bowls and arrange the avocado, tomato, and turkey on top. Scatter each bowl with the bacon and the remaining blue cheese, and serve at once. Winemaker, cook, and author, Lisa Pretty just released the second edition of her cookbook, Eat This with Paso Robles Wine, that’s filled with food and wine pairing recipes. And there are plenty of photos that prove why Paso Robles was named “2013 Wine Region of the Year” by Wine Enthusiast Magazine. In a large pan, heat butter and olive oil. Sauté mushrooms, carrots, celery, onions, and sage for five minutes. Add brandy and simmer for 10 minutes, add turkey and simmer five minutes more. Pour in heavy cream and stir continuously until all ingredients are coated and warmed through, season with salt and parsley. Use this pie filling in your favorite pastry: either pre-cooked pastry shells, a casserole dish topped with puff pastry and baked until golden, or in mini pie dishes with homemade pastry on the top and bottom, baked until golden. Mix all of the ingredients together. Pour mixture into a Pyrex dish that’s well-greased and bake at 350 F for about 40 minutes. I recommend mixing the eggs and milk then adding the other ingredients in amounts that suit your preference. Bon appetit!